It's been an exciting, exhausting year for new phones, and Google was the last of the big names to show off its wares for 2017 - the Pixel 2 and the Pixel 2 XL are now official and available, which means we can start comparing them against the main competing devices. For the Pixel 2, that really means the iPhone 8 from Apple and the Galaxy S8 from Samsung in terms of size, specs and price point. Has Google's latest handset got what it takes to rub shoulders with the best smartphones of the year? Here's everything you need to know. Your mileage might vary, but with its gorgeous-looking "Infinity Display" and that stretched 18.5:9 aspect ratio, we reckon the Galaxy S8 has this one sewn up. The other two are rather bezel-heavy and not quite as modern-looking as many alternative handsets this year, and looks and style are important factors for many a smartphone buyer. The iPhone 8 (above) gives you a 4.7-inch screen at a 750 x 1334 resolution, and overall the device measures 138.4mm x 67.3mm x 7.3mm. The Galaxy S8, meanwhile, is significantly bigger in terms of screen size - it boasts a 5.8-inch, 1440 x 2960 pixel display, with a chassis that comes in at 148.9mm x 68.1mm x 8mm. That compares with a 5-inch, 1920 x 1080 pixel screen for the Pixel 2, somewhere in the middle of the three devices. Google hasn't yet revealed the exact dimensions of the phone, but we suspect it's going to be along very similar lines to the iPhone 8 - if you care about millimetres, that's something to check up on. It's neck and neck for the Samsung Galaxy S8 (above) and the Google Pixel 2 in terms of CPU, as both carry the Snapdragon 835 - though in some regions that's replaced by Samsung's own Exynos 8895 Octa chip, which is about on a par with the Snapdragon one. The iPhone 8 carries the Apple A11 Bionic, a chip that beats the Snapdragon 835 in most pure benchmarking speed tests. The Apple phone has less RAM though, 2GB compared with 4GB for the Samsung and Google devices. 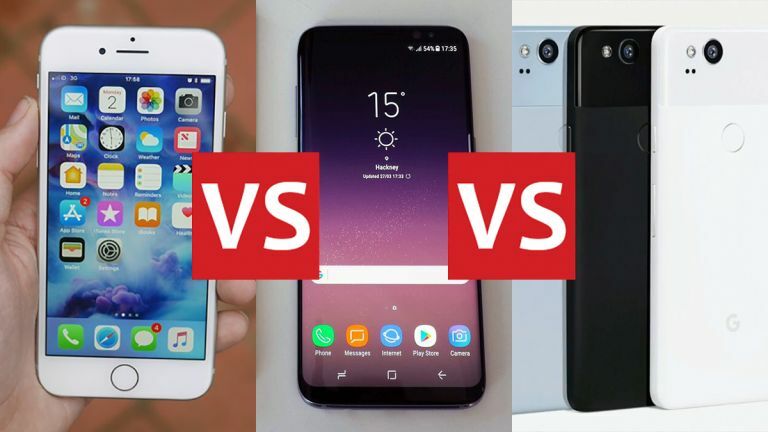 Ultimately though, at this stage in the smartphone game, it's less about raw specs and more about the experience the manufacturers have managed to eke out of their hardware and software - and all three of these phones are lightning fast, capable of handling anything you want to throw at them. You can pick up the iPhone 8 with 64GB or 256GB of internal storage, with no memory card slot; the Galaxy S8 is available with just 64GB internally, but that can be expanded. The Pixel 2 can be bought with 64GB or 128GB of memory inside, but like the handsets made by Apple, you can't expand that with a separate card. Cameras are of course hugely important for phones nowadays - in terms of rear-facing snappers you've got a 12MP camera on the iPhone 8, the Galaxy S8, and the Pixel 2 (above). Like the CPU though, it's less about the rating and more about the end results, and this is an area all three companies have always been strong in - it's likely that there's not much difference between the three. All three handsets are rated as waterproof or water resistant - the iPhone 8 and Pixel 2 can't go quite as deep for quite as long as the Galaxy S8, but they will survive a dunking. The Pixel 2 is the only one to not offer wireless charging, letting you put down your handset on a mat without having to hunt for a cable. Battery size isn't always an accurate indicator of battery life, but for completeness the iPhone 8 carries a 1,821 mAh battery, the Galaxy S8 a 3,000 mAh one, and the Pixel 2 a 2,700 mAh one. Apple always does a good job of making its phones very power efficient, so in everyday use we'd expect battery life to be similar across all three of these handsets. There's not a whole lot to choose between these three phones - all three are excellent 2017 flagships. Certainly in terms of raw power and camera performance we'd expect them to match up pretty closely, and you won't be disappointed with whichever one you choose. There's the obvious iOS vs Android issue of course, and the stock Android of the Pixel 2 might make you choose it over the Galaxy S8 if you're not a fan of Samsung's skin. Likewise iOS is a good a reason as any to choose the iPhone 8 over the Android phones. It's really the appealing design of the Samsung Galaxy S8, with that fantastic Infinity Display, that really makes the difference here - Google and Apple haven't changed the needle much in terms of design on the iPhone 8 and Pixel 2, so this is one area where Samsung definitely has the edge. The iPhone 8 can be yours from £699/$699, the Galaxy S8 from around £689/$750, and the Pixel 2 from £629/$649, depending on storage options. Can Nokia's new flagship cut it?